PCB routing occupies majority of the topology for system analysis. These routing traces resides on different layers of stackup and are subject to different performance variation due to different surrounding dielectric or conducting materials. The trace’s geometry factors, such as width, heights and spacing to adjacent traces also affect their performance significantly. Thus, a systematic method and flow to build such layer stackup/t-line model is needed. So are the capabilities to evaluate a t-line model’s performance in various metrics such as impedance, crosstalk and attenuation. SPITPro (TPro for short) is designed to enable such process and analysis capabilities for system engineer’s needs. TPro is an add-on of SPIVPro, SPISim’s waveform analysis suite, on top of SPISim’s framework. It delivers cross platform capabilities in a straightforward GUI presentation. SPISim framework also provide some infrastructural services such as scripting support, full featured text editor, and difference viewer. 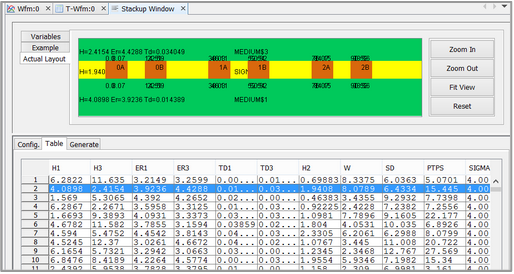 Extract performance parameters and model. TPro has step-by-step wizard to guide through this process. In addition to t-line model generation, TPro also has T-Line focused model inspector which can be used to view given model(s)’s various performance parameter instantly. For example, if one want to know whether received t-line model’s impedance matches that of previous stage, it will be just a click a way in this model inspector. In addition to frequency domain waveform, the matrix’s content at a particular frequency can also be inspected easily. A SI engineer will also encounter needs to do quick what-if analysis of a trace model without performing actual simulation. Other needs like to be able to combine existing t-line models, trim data points or tweak existing model for different impedance etc may also comes handy in daily analysis routine. These are all supported by TPro. 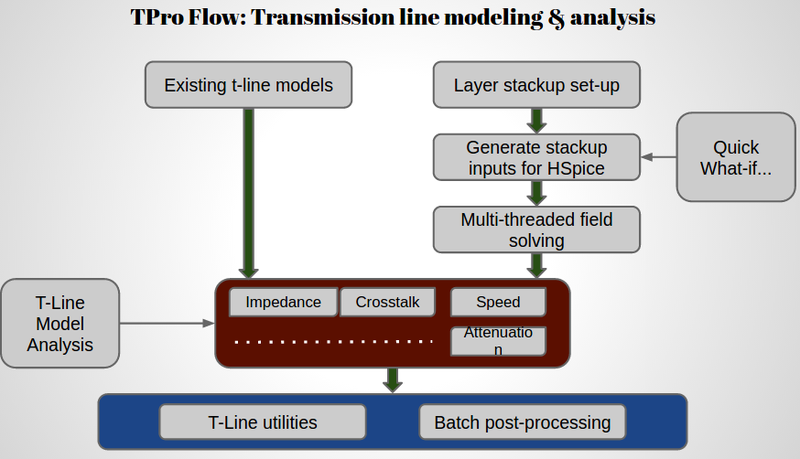 In summary, SPISim’s TPro module provides all the modeling and validation needs for SI engineers when it comes to PCB’s layer stackup and transmission line analysis.